Governor Rochas Okorocha has said that his administration is not owing any bank either in the Country or outside the country and that he stands to be challenged by any bank or individual on this Claim. 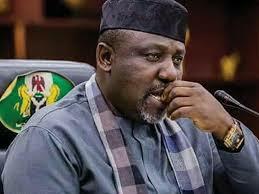 Owelle Okorocha spoke while interacting with Journalists in the State, on Tuesday, February 5, 2019 at the Government House Owerri, stating that Chiefs Araraume, Ohakim, Uzodinma and Ihedioha have no programme for the State and that is why instead of telling Imo people about their programme for them if elected governor, they are going about talking about Rochas Okorocha and the billions they Claimed he is owing the banks. The governor stated “I am not Contesting for the governorship of the State again. But they have no programme for the State. They are the ones spreading the false story of my administration owing banks. I am not owing any tank. Let such bank come up now and not when I leave office they would come up with a story. And those making such unfounded claims should also come up with their facts”. He continued “So, the only indigenous Candidate we have now is Ugwumba Uche Nwosu who is from the youth, from the men, from the women of Imo State. And you can see how his popularity is soaring in the State and beyond. So, we must stop this imposition”. According to him “The battle isn’t about Uche Nwosu becoming the governor, the battle is about bringing Rochas down because of what is going to happen politically in future. And my brothers and sisters are being used because we don’t raise our own up, rather we raise others up and bring our own down”. On INEC, the governor remarked “I have absolute confidence in INEC. It’s not INEC alone that Conducts election, Army, Police and others. But INEC alone cannot guarantee free and fair election. It takes everybody. All hands must be on deck. But what these people want to do is to come with fake Army, fake Police collect result sheets and run. But we are waiting for them, I’m waiting. I can’t say more than this”.